Your dream vacation awaits at this magnificent "seaside retreat." Seaside Retreat is a well-maintained 2 bedroom, 2.5 bath condo that is beautifully decorated. 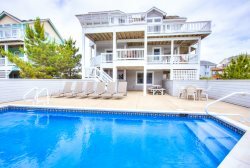 Seaside Retreat is in a prime location to make the most of your dream vacation on the Outer Banks. The home is centrally located in the quaint village of Duck, and allows guests to walk to the unique shops, fine and casual dining spots, and area attractions that make the town a popular vacation spot. In addition, there is a great walking/biking trail that meanders through the village that is also within walking distance. Arguably the finest attraction of the Outer Banks is the pristine beach that stretches on for miles. At Seaside Retreat, you will be diving in the waves and digging your toes in the sand in a matter of minutes. Beach access is only 250 yards from your door. Seaside Retreat is impeccably decorated and has a great beach feel. The fully equipped kitchen has all the comforts of home and makes meal times a joy. The open floor plan brings the kitchen, dining, and living areas together giving guests the ability to visit and spend time together throughout the home. Guests of Seaside Retreat have full access to the community pool, tennis court and grill area. Need more than one vacation home? GTS39 is close by to help accommodate larger groups. Reserve today and enjoy a unique Outer Banks vacation steps from the beach. Lower Level: Entry; laundry (separate room outside of condo). Mid Level: Kitchen; dining for four and two at the bar; living room with comfy new sofa and TV with DVD; half hall bath. Top Level: Queen master with TV and DVD; Master bedroom with 2 Twin beds.